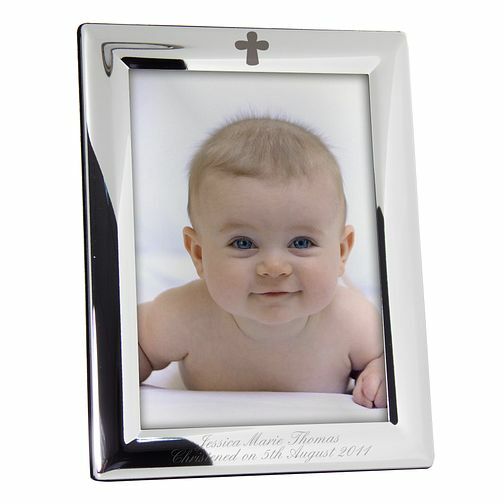 An elegant addition to the proud parent's mantelpiece, this gorgeous silver plated 5 x 7 photo frame is engraved with a single cross motif and the personal words of your choice.Perfect for a Christening or Baptism, please refrain from using block capitals in your personal message. Engraved Elegant Cross Frame is rated 4.0 out of 5 by 5. Rated 4 out of 5 by Anonymous from Very pleased with this product A good quality product, easily ordered and good value. Rated 2 out of 5 by Anonymous from Faint Engraving Nice gift for christening but engraving was disappointingly faint.